I wonder how many pictures of Muskoka Chairs there are in my photo collection. I'll start to gather them into a poster collage. 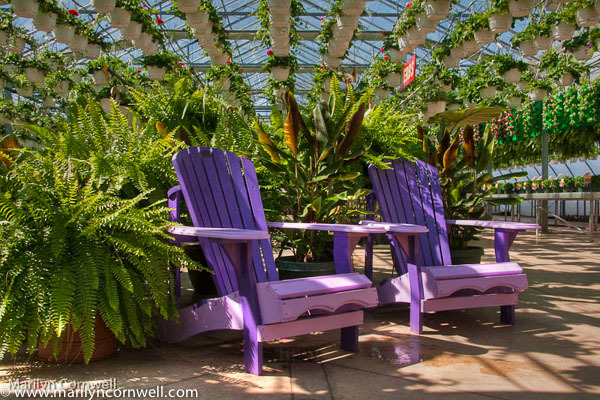 If we were in the North-Eastern U.S. we would call them Adirondack Chairs. Wikipedia redirects one from Muskoka to Adirondack for information about the chair. However, it doesn't explain how the chair migrated to Muskoka and got 'renamed'. 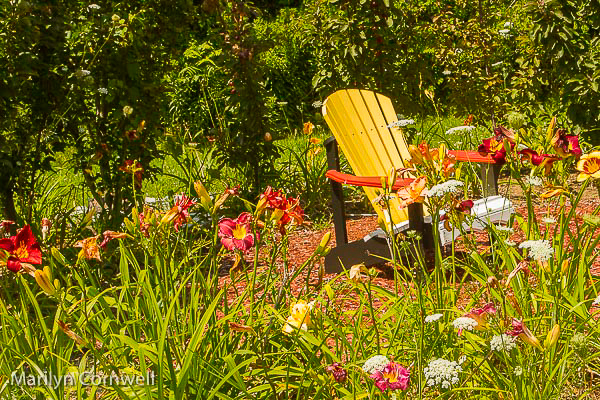 Back to Adirondack, the chair was originated by Thomas Lee in 1903 while on vacation in Westport. He offered the design to his friend, a carpenter in need of winter income. That explains the patent by Harry C. Bunnell rather than the originator, Thomas Lee. The article says that Bunnell registered the patent without telling Lee, and that Lee was surprised, but then didn't mind. Muskoka Chair Company is in Port Carling (that's in Muskoka), dedicated to making these wonderful, iconic, outdoor chairs.